If I do not know the trend, I do not trade. I can make a fortune by predicting the direction in future but I can also lose more than a fortune betting. It is no difference from putting money to the casino. In order to illustrate my point, let's look at SMRT shares right now. A descending triangle has formed over the last few weeks, leaving the shortists in glee. Price action was coupled with good increasing volume in the direction of the trend. But guess what now? Volume has dipped over the last 2-3 days. There was a very very weak breakout from the pattern with prices trending above the $1.73 major support line. Bollinger bands are tightening, further fueling a possible increase in volatility in the near future. MACD is showing a divergence with price movement, which may indicate a rise in price to come. Moving averages are trending down strongly. Pattern was broken weakly. 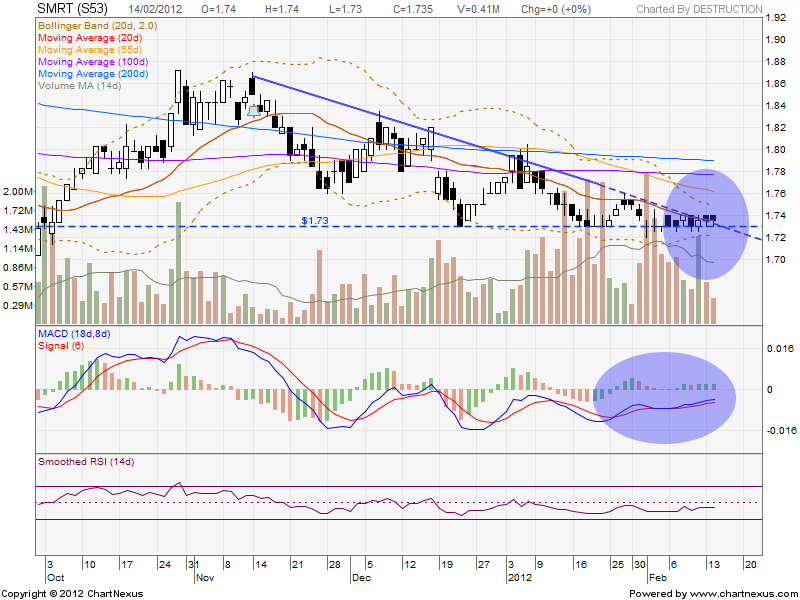 RSI still weak. Would you go long or short? I hope you do not choose to flip the coin to decide its direction as the same coin flip will decide your profits.